and sea trout. But that just scratches the surface of what can be caught in this highly active estuary system. 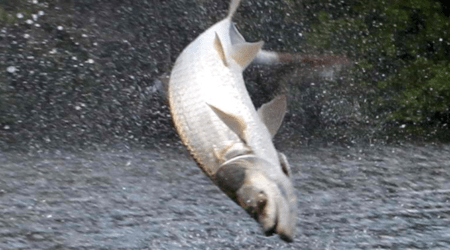 Whether fishing the backside along the many intercoastal waterways, the mangrove systems, flats, or even further back in the Long and Cross Bayou’s – this area is active all year long. Southern Outdoor Sportsmen offers guided trips daily into Madeira Beach with some of the best guides in the state. So whether looking to sight fish the flats, hit the mangrove systems, or even trek the intercoastal waterways – we have you covered! This is a trip and an area you simply do not want to miss. 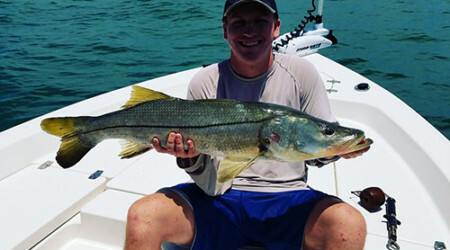 Southern Sportsmen Outdoors offers competitive pricing for our Madeira Beach fishing charter offerings. See current rates (including info for half, 3/4, and full day trips) and details (what to bring, what to expect, etc) at the link below. Madeira Beach offers tarpon anglers the chance to chase the silver king along its coastal white sand beaches. During the yearly migration there is simply no better way to spend your day on the waters here – including in the backcountry as well! Madeira Beach is situated just north of Tampa Bay and south of Clearwater. In this stretch anglers will find a multitude of fishing opportunities within its extremely diverse ecological system. It has a direct feed from the Gulf of Mexico, and also has a protected backcountry system. This combination of features makes Madeira Beach a simply awesome place to fish all year long. Johns Pass crosses the southern tip of Madeira Beach and is well known for its shopping, entertainment, dining, and of course – the fishing! If you are vacationing or visiting this area, give Southern Outdoor Sportsmen a call or email to get started planning your epic day at the pass! Madeira Beach is immortalized for pristine jade-turquoise waters. Anglers agree that these Gulf Coast waters are abundant with the day’s catch, Snook, Seatrout and Redfish leap from the brine. Moreover, seacombers relish in stumbling upon large conch shells. It’s said that Madeira Beach possesses everything the sun-worshipper desires – shoppers stroll along John’s Pass Village and Boardwalk, and historians gossip about the region’s two noteworthy residents: Babe Ruth and Jack Kerouac. Madeira is plentiful with opportunities to reel-in Seatrout, Snook and Redfish. A local angler, on Floridasportsman.com, shares reflections on the region’s fishing: “night time fishing is great [for reeling-in a catch], Shrimp, White Bait and artificial [lures] work fine. [Additionally], there are plenty of docks that have moving water and can be fished effectively.” You know the saying: wherever there’s moving water, there’s fish. Redfish school along the region’s flats and docks. Red Drum, locally called Redfish, spend much of their life along Madeira Beach. Local anglers easily retrieve this popular catch with a light/medium action pole and White Bait (Pilchard). These copper-bronze fish reach about 30 inches in the region’s inshore waters. Seatrout are among some of the region’s most sought-after catch. They spawn, during November, in Madeira’s shallow inshore waters. According to the Florida Fish and Wildlife Commission (FWC), Madeira’s Seatrout are easily reeled-in with live Shrimp, Pinfish or Pigfish (grunts). These fish school among the region’s grass-bed holes. Anglers find casting with a float, soft-bodied jig, top-water poppers and spoons very effecting for catching Seatrout. Seatrout, arguably, make for some of the region’s best eating. It’s suggested to cook the fish in a skillet and serve it with Horseradish. Snook are a prized catch among Madeira’s anglers. According to an angler at Floridasportsman.com, “Gator’s Dock holds lots of Snook and are quite visible after dark.” John’s Pass, referred to as Gator’s Dock by locals, is the 1100 foot boardwalk that tourists rave about. Anglers are permitted to fish along the boardwalk, though some locals complain. After dark, snook can easily be seen swarming around the pier. Madeira is not the beach for meditation. It’s a bustling epicenter of water sports and tourism. Locals and visitors share the sun and sand. Moreover, a prize catch lurks beneath the docks. Anglers easily reel-in Snook, Redfish and Seatrout from these calm waters.